The answer may be obvious to some but there are some reasons to use grip exercises which you may not think about. You grip a handle of some kind during most exercises. This holds true whether you use machines or free weights. If your grip is the weak link, you will not be able to get the optimal benefit from most exercises. Good examples would be dead lifts, pull-ups, or heavy dumbbell rows. It doesn’t matter if you have the strongest latissimus dorsi and biceps in the world. If your grip is weak you will not be able to hold your body weight up very long. You will not be able to perform as many pull-ups as your muscles potentially could. If you think you do not need a strong grip think again. Recreational weight lifters, athletes in many sports, certain professions can benefit from grip exercises which strengthen your grip. If you can think of any negative factors of a strong grip please let us know. You cannot use wrist straps in power lifting competitions. Try dead lifting or clean and jerking 600 pounds with your bare hands. If you are a ball carrier, you must not get the ball stripped. If you are on defense your ability to grab on anything you can get your hands on and pull down the ball carrier could be the difference between a win and a loss. The list goes on and on. Unless you are a competitive chess player, a strong grip will most likely help you at your sport or activity. Hitting in baseball or is all about bat control. You have to control a long lever at the point where you have the least mechanical advantage. Hanging on a ledge thousands of feet up with your life in the balance, your grip could determine whether you live or die. Not just extreme situations in rock climbing require a strong grip, grip exercises will increase your endurance as well as strength. In addition to strong elbow flexors, grip and forearm muscle strength will separate a champion from a wannabe. With the exception of soccer or other sports which don’t involve the hands, grip strength can have implications that could increase your performance in that sport and especially the training. When is the Best time to Work on Grip Exercises? Since a strong grip is a mix of strength and endurance you can work on both during most workouts. The first exercise you perform for each workout is the best time to work on grip strength. When you first start your workout, your muscles should be fresh. This is the best time to test your grip strength with a heavy exercise. Great heavy exercises to start with are dead lifts, pull-ups, dumbbell rows. You can even perform the farmer’s carry which is simply picking up heavy dumbbells and hold them for as long as you can. You will probably walk around while you do it because the burning in your forearms will be so intense. At the end of your workout, especially a back workout which has a lot of pulling is a good time to work on your grip endurance. This is the time to use grip exercises which are specifically for your grip. Always remember though, most exercises can help strengthen your grip, especially forearms exercises. Should you Use Wrist Straps for Grip Exercises? Wrist straps give you an artificially strong grip. You should only use wrist straps if you already have a strong grip. They are good for extremely heavy maximal lifts such as dead lifts in which the weight is mega heavy. Wrist straps are also good for people who look to isolate their lats to the max on pull-ups or lat pull downs. They are also good for heavy barbell or dumbbell shrugs. 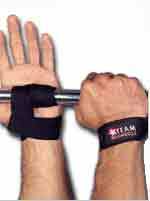 Basically if you have a strong grip and it gives out before your muscles do, you can benefit from wrist straps. You wrap them around your wrist. When you cinch wrap the strap around the bar you can cinch it on your wrist so hard it is like the dumbbell, or bar is attached to your hands. The wrist straps made from leather are much better than the cotton straps. Don’t confuse wrist straps with wrist wraps, which are for wrist support. What are some Good Grip Exercises to Strengthen Your Grip to the Max? There are many exercises which you can use to strengthen your grip as previously mentioned. Here are a few exercises which are versions of common exercises which will really test and help you strengthen your grip. One grip pull ups are one of the best grip exercises because they allow you use your grip like you would in a real life situation. These are not one arm pull ups because you will use both arms pretty evenly. These are especially good for anybody who needs a strong grip for their sport or job such as wrestlers, MMA fighters, rock climbers, or police officers. Start: Take a deep breath and focus. Jump up, or grab on a bar or ring or whatever you are pulling up to. You can either take an overhand grip, or a grip where your palm is facing you. Grab the bar with one hand, and grab your wrist with the other. Begin the motion: Pull yourself up until your chin approaches the bar. You can pause on the top for a split second before you let yourself down slowly all the way back to the original position and repeat. Modifications: You can either perform as many reps as you can on each hand, or do a single rep at a time. Your grip should fail first. If your grip does not fail after a certain number of repetitions, just hold on as long as you can until it does. This set of three different alternating dumbbell curls will work all the muscles in your forearms, and all the flexors in your upper arms. Your grip will be tested through different movements and planes of motions. You will get an incredible pump in your forearms from this exercise. You can either use them as arm or grip exercises. Start: You can either stand or sit on something. Hold a pair of dumbbells at your side and have your palms face your body. Keep your body in upright posture and draw in your core and stabilize your shoulders back in retraction. Begin the motion: Start with hammer curl. Curl your arms up with your thumb going up toward the ceiling. Slowly lower the weight all the way back to the original position. Next, perform a supinating biceps curl. As the dumbbell passes your leg externally rotate your hand. Lower the dumbbell back down the exact opposite of the way you raised it. The final curl is a reverse curl. Pronate (internally rotate) your hand slightly before you raise it. You do not have to fully pronate your hand. Do whatever your wrists are comfortable with while you try to keep your elbows in at your side. Modifications: You can set your own rep scheme. Usually you will alternate each curl and do 21 reps, but you can do whatever you like. You can use a free motion cable machine instead of dumbbells for this and many grip exercises. Dumbbell supination and pronation is one of those exercises which is more mental than physical. As with most grip exercises, you can use it for forearms, and your upper arms as well. Start: Take a pair of relatively light dumbbells and bring them up to a 90 degree angle. Hold the dumbbells in the middle so the sides of your hand are not touching either side of the “bell” part of the dumbbells. Keep your shoulders retracted, and your elbows at your sides for the duration of this movement. Begin the motion: Slowly supinate (externally rotate) your hand with the dumbbell as far as you can go. Hold for a second when you reach maximum supination. Next, pronate (internally rotate) your and as far as it can go while you keep your elbows at your side. When you reach maximum pronation hold for a second, squeezing your grip and forearms tightly and repeat. Modifications: You can perform this with something longer such as a baseball bat or body bar increase the difficulty if you are trying to strengthen you supination and pronation for sports. Where can You Find More Exercises to be used as Grip Exercises? You can use forearms exercises as grip exercises to strengthen your grip as well as build the forearm muscles, the wrist extensors and flexors. Don’t know how many sets and repetitions of grip exercises you should do? Learn why counting reps may not be the best answer. Find exercises for the entire body. Simply look at an anatomy drawing and click on any body part which you want to exercise and you will be brought to that page. 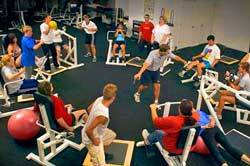 Exercise videos only; organized by body part and equipment.